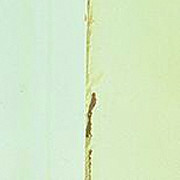 Blocking occurs when two freshly painted surfaces stick together when pressed against each other, such as a door sticking to the jamb or window sticking to the sill. Frequently, when one surface “breaks” free, it leaves paint from its own surface or peels paint from the opposing surface. If the area has never been painted, prime the surface with a high-quality primer. If a blocking condition already exists, scrape or sand the surface to remove all loose paint. Clean off any dust or dirt and then prime the area with a high-quality primer. Doors and windows should be properly adjusted for free and smooth operation before painting. Use a top quality semi-gloss or gloss acrylic latex paint. Low-quality latex paints generally have poor block resistance, especially in warm, damp conditions. Acrylic latex paints generally have better block resistance than vinyl acrylic paints or alkyd and oil-based coatings. Alkyds, however, can develop superior block resistance as the film hardens.